Photographs of actual diamond ring based on this design. Larger photographs of completed ring. This Engagement Ring commissioned via the Internet. mm: 4.89 x 4.42 x 3.25 depth. VS - G,�mm: 3.0 x 2.0. Photograph of diamonds prior to setting. 1) Ring to have a delicate feel for smaller ring size. 2) Ring edges softened from drawing. 3) Baguette cut diamonds to tuck under princess cut diamond. 1) 18 Karat yellow and white gold ring. 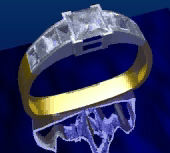 5) $ Price withheld Michael Drechsler Jewelry Ltd. The .Avi Movie of the ring design (428 kb).